This looks amazing with a lot of possibilities! If we are using it with Raspberry Pi, we do not need wifi, bluetooth, sd card module but of course as a standalone unit we might need it. I was working on the "Recognition of Activities of Daily Lives (ADL)" and there was requirement for a 3-axis accelerometer. The problem is: if we use 3-axis accelerometer grove module, for better result it should be mounted parallel to the board. It would be very helpful to add a 3-axis accelerometer on the board itself which I think would not take much space. It will be beneficial for other use cases like auto-rotate lcd screen, free fall detection (to save data before it crashes! ), almost all robotics projects (auto driving) needs it. I am eager to try it out soon! Thanks for the suggestion, a 3-axis accelerometer sensor integrated on the board is surely more convenient than using Grove. Will try to find a cost-effective one so that not adding too much cost for our users, do you have any recommendation for the 3-Axis accelerometer sensor? I think ST LIS2DH12 is low-cost and ultra-low-power and also useful for gesture recognition, free fall and wake up detection and many other features. 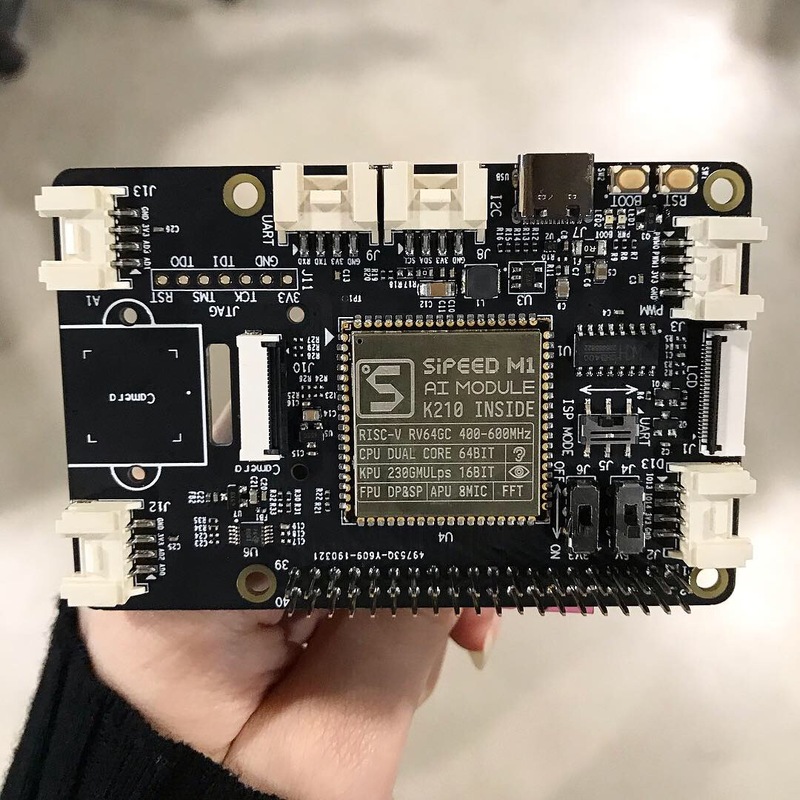 UPDATE: We just got the first look of this Grove AI HAT for Edge Computing and Raspberry Pi based on the Sipeed MAIX-I, including LCD and Camera Interfaces, connectors for Digital, I2C, UART and Analog. Don’t hesitate to share your thoughts and ideas with us in this forum! Let us know what features you would like to see and have the chance of making it to the final product. Wow, looking cool! Hoping to see an accelerometer in the next revision and want to try it out soon. I think it's a good idea to add a connector for a battery pack, not to power the board with the battery only but to have an UPS for short power failure. It could be very useful to prevent data corruption. Thanks for all the wonderful ideas! Here is an update about things we are going to add to the next version. 1. 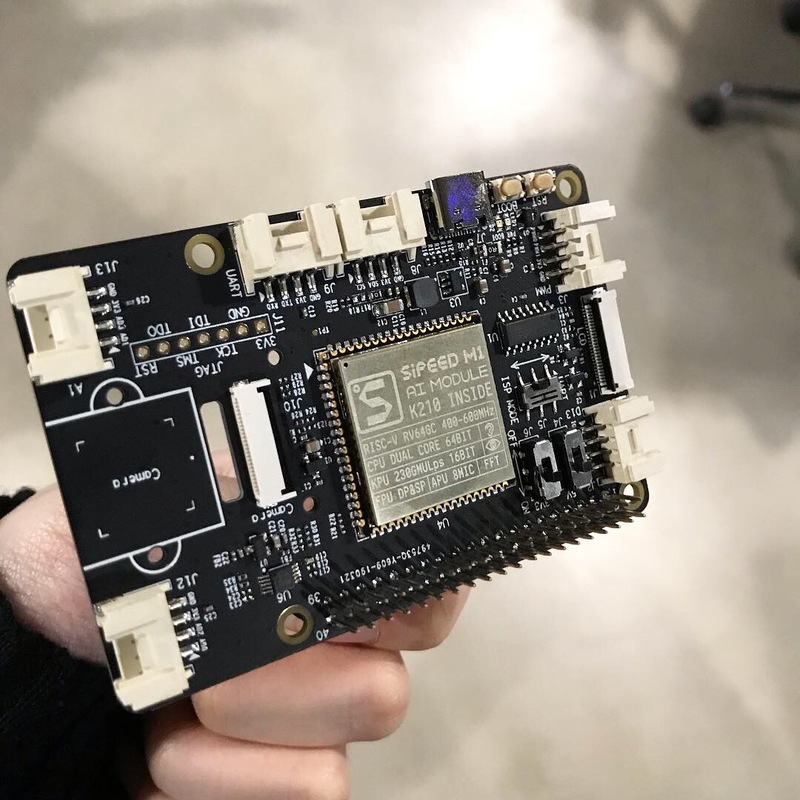 There AI HAT can power Raspberry Pi directly. Just use the onboard switch to switch power mode. 2. There will be a microphone on board, the same microphone as the Sipeed 6+1 micarray. 3. There will be an ADXL345, 3-Axis Accelerometer on board. We choose this one because there is already a Grove version of the sensor, the software is ready, easier to get a sample, and also lower cost. 4. There will be a user button, and the boot LED can be used as user LED. 6. The 40-Pin interface will be changed to SMT female header. 5. The JTAG package will be smaller. We will finish the layout in a week, and get samples of the second version in the week of 22-Apr. If everything goes well, we will do pre-order in early May. This processor has an amazing APU ( audio processing unit ) that is capable of handling ( 8 ) 192 khz audio streams with hardware accelerated FWT processing. It would be a shame not to have a way to access those features via I2S. It would make an amazing engine for processing high-end audio, especially in combination with the Pi. Please consider adding a camera that is ideal for future machine vision applications. At the moment Pregius Gen 3 Global Shutter CMOS is the my favorite. What do you expect from a good machine vision camera? For conservation projects, the embedded vision camera need specific requirements. Camera with IR cut filter / IR-white-red flash /star light camera are ideal.